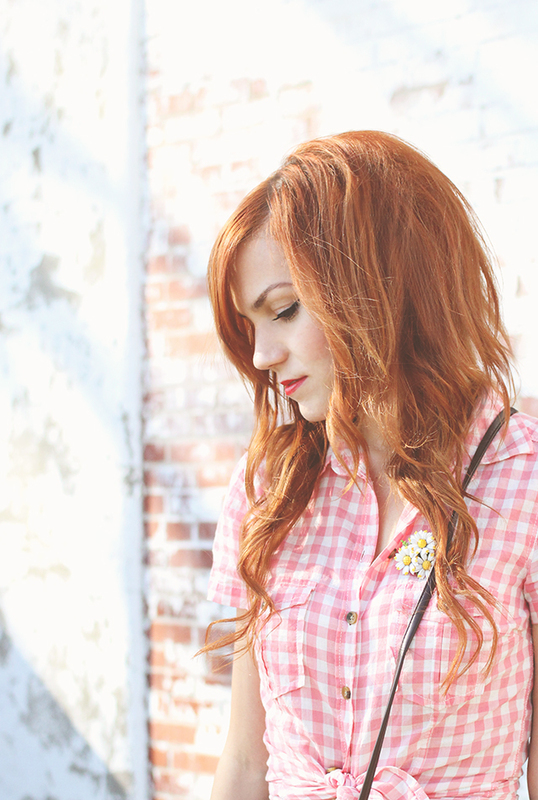 I'm partnering up with ModCloth today in celebration of their pretty new Festival Style Section. Normally when I think of "Festival Style" I think of lace, crochet, and muted colors, but to break the norm of the style "boxes" that we can get stuck in, I went for a more colorful and breezy outfit! Now, if I were actually going to a festival there would be NO WAY you'd catch me in heels. I would, however, be toting around this apple purse, because I'M IN LOVE, I'M IN LOVE AND I DON'T CARE WHO KNOWS IT. There hasn't been much sun around these parts this week and these photos are making me yearn for sunnier days! What are you looking most forward to right now? 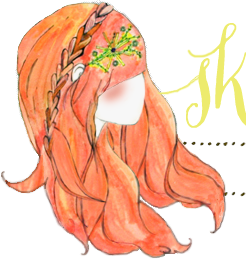 I have a blog re-design in the works and I've started working on an e-course, so I'm feeling pretty pumped about all of it! This is my first e-course and I know it's going to be a lot of work, but a lot of fun! Now, if that sun would just come back and give me that extra little boost of energy! **I'm still using and loving the new ABM Actions. These were edited with Lux from the Signature Collection. Just thought I'd share! Such a cute outfit! I absolutely love that skirt!! yay for elf references! i love this outfit too (and your tiny waist! ), but i would never wear heels to a festival, either. i'm so excited for your blog makeover and eclass!! Omg the apple purse is to beautiful! you look gorgeous as usual. Love love this outfit! So perfect! Love this outfit! That skirt is amazing! I love this outfit and the little flower pin is so cute! I love this outfit! And I totally agree about festival style boxes and I love your mix on it. Also, that purse! I just love the colour of your hair, it's so beautiful! Your festival outfit is super cute! I love reading about the festivals that start happening around this time bc here in NZ festival season is over and we are heading into winter ! this is really cute. i'm an avid concert goer/festival attender and always think chicks look so contrived! like they are dressing in costumes of what they think "festival people" look like. this is breezy and comfy looking. two thumbs up! Love love love that skirt and LOVE LOVE LOVE your hair! PS: Now that I'm pregnant, I'm even more in awe of that fact that you've had two kids and look amazing. Have you posted at all about your health/fitness routine or would you be willing to? Thanks! I love this look! And the shoes are gorgeous. This outfit is amazing! It screams spring and brings out the fun! This gave me an idea on what I could wear tomorrow! The summer heat is here in the Philippines! 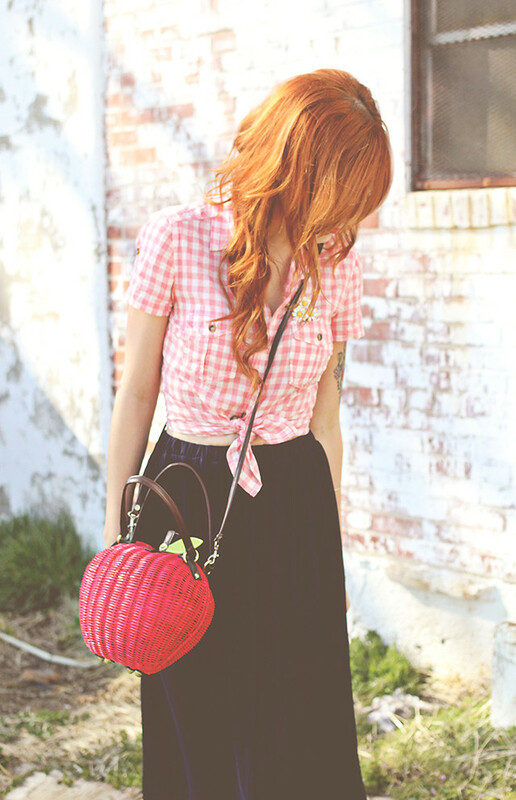 I adore gingham shirts tied at the waist - it looks supercute! And that apple bag?! Amazing. Those shoes are absolutely the bees knees. 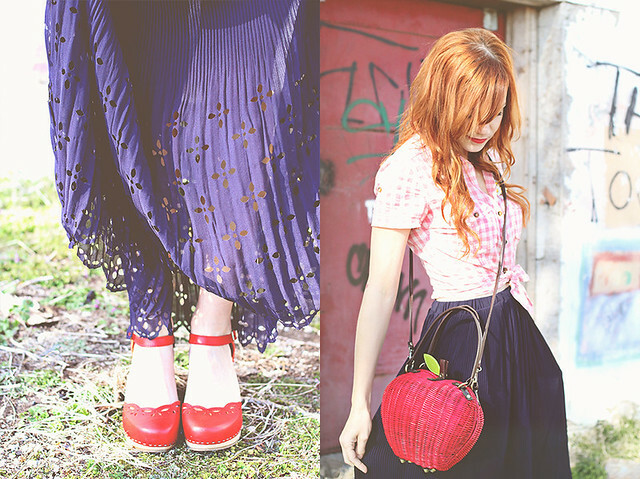 So cute and so well paired with that skirt. Sweet outfit. the skirt is gorgeous!! love that! This is adorable! I can totally see going to a festival or a picnic in this outfit (minus the heels, of course!). The apple bag, though, is the darned cutest thing I've ever seen!! !